Lit'l Wiener Shells and Cheese Pizza - What the Forks for Dinner? Tim and I are of the contention that, you can put anything on a pizza and it will taste good! 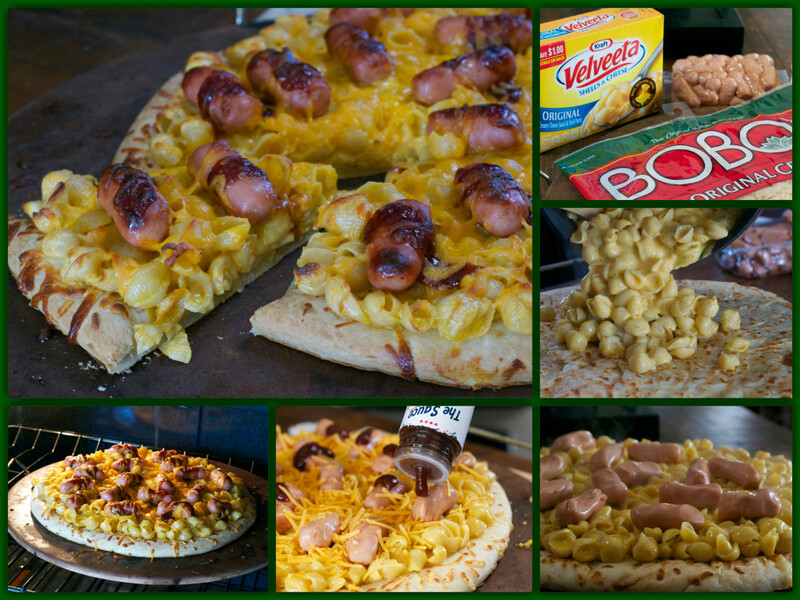 Lit’l Wiener Shells and Cheese Pizza proves our point…….so, grab your kids……and those who are kids at heart and take a peak at this pizza! Macaroni and cheese……who doesn’t love it? Kids will eat it when they will not eat anything else. Adults….well, we just like pasta and cheese. When we are at a loss for what to have for dinner…….I know, I know but it happens, we reach for a box of Velveeta Shells and Cheese. In this blog house it is the only mac and cheese …….period! 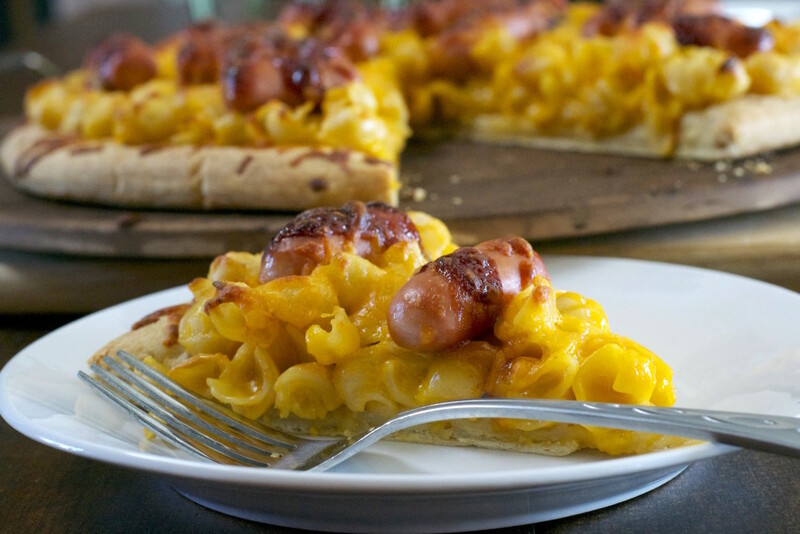 Pursuing Pinterst you can find many versions of a mac and cheese pizza. They are all pretty standard, crust mac and cheese, bake. Remember as a kid the joy of hot dogs and mac and cheese for supper? I sure do! 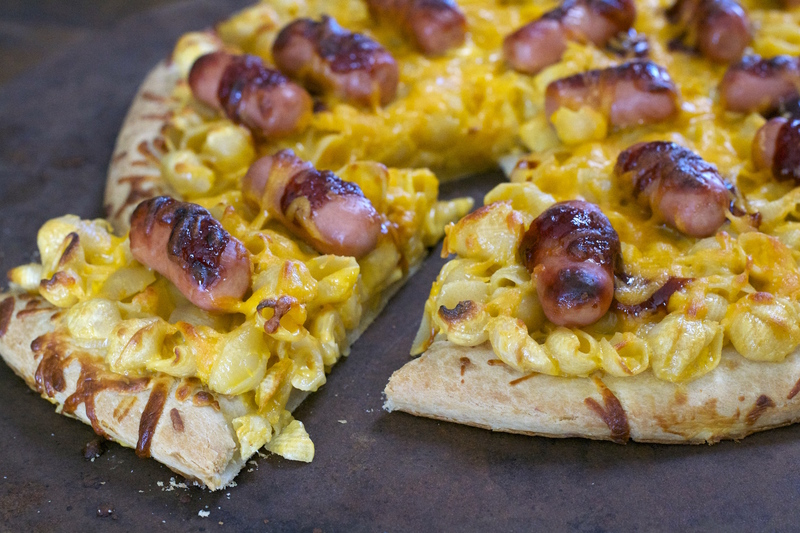 Mac and cheese pizza needs dogs……thats right I put mac and cheese and hot dogs on a pizza crust……Tim and I were right! You can put anything on a pizza and its great! Now, about those hot dogs…….I was going to just slice up hot dogs and put them on the top, or mix them in with the mac and cheese, I wasn’t sure which. Standing in the grocery store…..my home away from home, in the hot dog section……..I spied Lit’l Weiners …….yep, little bite size dogs…….perfect for my pizza plan. 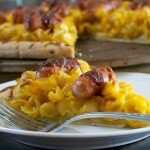 I used a prepackaged crust to keep it easy, made the mac and cheese(I saved a bit of the pasta water and added it to make the mac and cheese a bit creamier), put the mac and cheese on top the pizza and added the dogs. But, the dogs looked a little bare. So, what goes with hot dogs……ketchup of course. That’s right, I put ketchup on hot dogs on mac and cheese, on pizza! Ok, I really used Sweet Baby Ray’s BBQ sauce, but if you are making it for children I think ketchup is the perfect thing. Everything got a sprinkle of shredded cheddar, a few minutes in the oven……… viola……Lit’l Weiner Shells and Cheese Pizza. Kids will love this, so will adults, it was quick easy, and forking yummy!!!!!! Make Mac and cheese according to package directions. Drain quickly so the pasta retain some of the water so your Mac and cheese is really creamy. Place pizza crust on pizza stone or cookie sheet. Top with prepared Mac and cheese. Top with lit’l wieners. Place a dollop of ketchup or bbq sauce on each wiener and sprinkle whole pizza with 1/2 cup shredded cheddar cheese.